We tried every Yasso flavor out there and now have an official BTD Yasso Flavor Bible. I’d like to think it’s official at this point: I’m the girl who always talks about Yasso. Right?! Well, at least if you follow me on Instagram to ANY degree, then you’ve heard how obsessed I am with Yasso’s frozen Greek yogurt. Thankfully, it looks like y’all are huge fans too! It’s incredible – I get hundreds of DMs each week from y’all telling me how much you, your baby, your brother, sister, and all-your-people love Yasso too! It’s SO MUCH FUN. Personally, I did not expect this to snowball the way it has. I just adore the product, the colors, our BTD comradery: IT’S A WHOLE THING. I get asked a lot about which flavors are the best! After a few of you suggested I put together a “Taste Test” of all the flavors, I decided it sounded like too much fun not to jump on the idea! 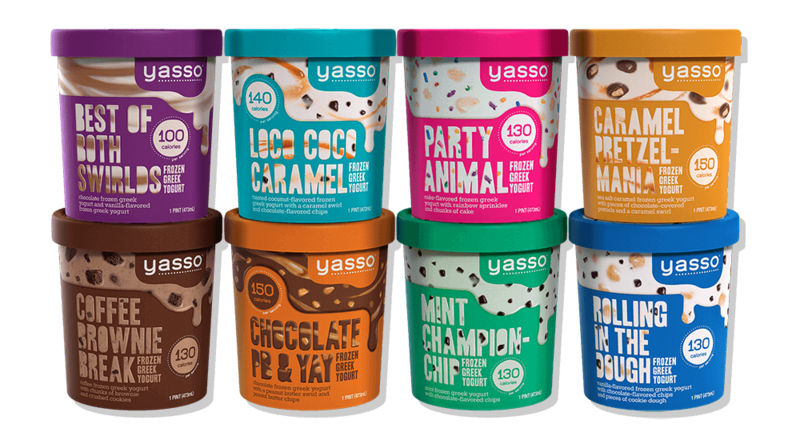 To make this taste test official, I enlisted my roomies to help me out with the task: put together a blog post with reviews of all Yasso’s flavors! Consider it the official thesaurus for Yasso’ vast flavor collection. If your friend or sister (or boyfriend…) needs help deciding on a flavor – send them here! To make it even easier for y’all, check out Yasso’s Store Locator to find stores near you that carry your favorite flavors! Strawberry – The first thing you’ll appreciate about strawberry is the color. So smooth and tranquil. It’ll remind you of Marvin Gaye or Leon Bridges. Or, dare I say, Maroon 5 (think Sunday morning). To that end, the flavor matches the spirit of the color, with the cool taste capturing refreshing and soothing notes. For all of my die-hard strawberry fans out there – this bar is for you. My boyfriend loves strawberry milkshakes, and I was thrilled when he raved about this bar. He is only interested in flavor, but I’m proud I tricked him into liking something healthy. Iron sharpens iron, right? Black Raspberry Chip – I’d say that in a tug-o-war between raspberry and chocolate, this one definitely lands on the fruity side. But that’s why I like it. You get the refreshing delight of a raspberry treat with just the right amount of chocolate accent to keep things interesting. Chocolate Chip – The chocolate chips inside of this bar are the perfect texture to compliment Yasso’ signature vanilla frozen Greek yogurt blend. I love it for those days you don’t want to get too complicated: balanced, steadfast, delicious. Just the right combination. After dinner, snack, or heck, even for breakfast. I mean it is only 100 calories! Chocolate Chip Cookie Dough – For all my BTD fans, y’all KNOW this is an easy one. This is my all-time personal favorite. When in doubt? I pick this chocolate chip cookie dough. Good day? I celebratorily pick this one. Bad day? I need this one to make it to the next day. Ultimately, what I love about this one is that the cookie dough is to die for. And, what’s more. You’ll get a taste of cookie dough in every bite. I can’t recommend this one enough! Cookies n’ Cream – Everybody LOVES Cookies n’ Cream. Since childhood that is a go-to safe bet for all mankind (pretty much literally). And fortunately, this delightful bar does not disappoint. This bar is chalk-full of tasty, creamy cookie bites mixed amongst Yasso’s signature vanilla. For all my mommies so dear out there – this is definitely a favorite amongst children! Fudge Brownie – Fantastic Fudge brownie. Even though I’m not *huge* a chocolate fan, I loved this one. What’s more, my taste-testing roommates, who are brownie experts absolutely adored this one. The bars consistency is perfect, and the fudge brownie crumbles packed into the bar are to die for. Mint Chocolate Chip – First thought? So Fresh! So cool! So refreshing! Mixed with Yasso’s minty frozen Greek yogurt and rich chocolate chips; just a match made in heaven. Sea Salt Caramel – This bar, from the first bite, is so sweet! But it gets incredible balance from the salty elements. The best part though? If you like caramel, about halfway into the bar, you’ll be biting into a caramel iced filing that will be both surprising and satisfying! Toffee Caramel Chocolate Chip – The warm flavors of the caramelized toffee cuddles up next to the chocolate chips that complement the cold creamy Yasso base. It’s like when Fall is just becoming winter. Still warm and sunny, but with the perfect chill…what more could you want?! 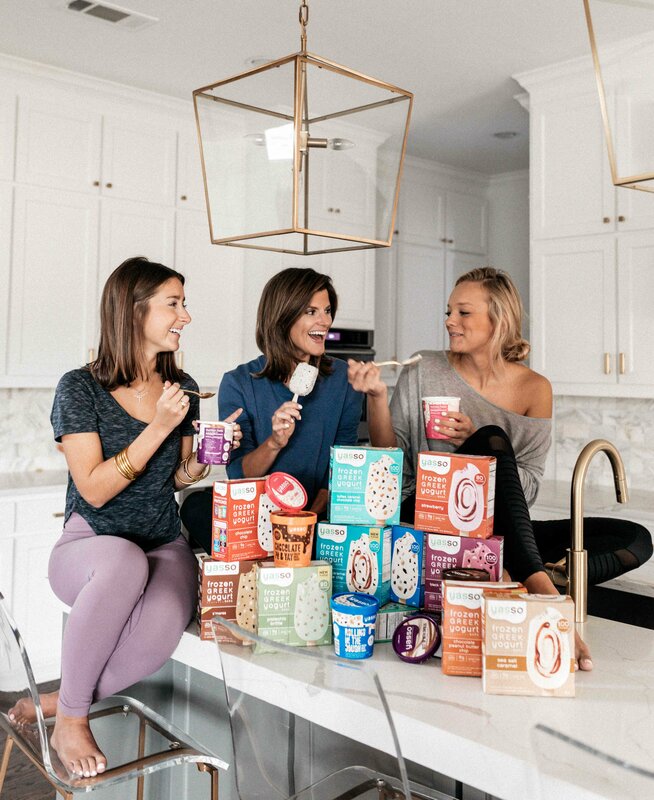 My friend Michelle says she hides these from her husband because she says it tastes like something really bad for you but thankfully it’s not – the perfect guilt-free indulgence! Vanilla Bean – Indulge (without guilt) in this rich vanilla delight. If you’re a vanilla purist, you’ll definitely respect the real vanilla bean flecks mixed into this classic vanilla flavor. Besides the incredible, real-vanilla flavor, the other best part? 80 CALORIES in a bar. Need I say more? Highly recommend for your Dads that are stuck on never trying anything new btw. Chocolate Fudge – I mean, again, I’m not a *huge* chocolate fan but Yasso’s chocolate fudge bar is everything you’d expect and want from a frozen fudgesicle and more. But the best part is that you don’t have the accompanying guilt. Chocolate fudge is a familiar favorite, a flavor you really can’t go wrong with. If you’re feeling risk-adverse and want something reliable that won’t be too much of a surprise, then this flavor is just right for you! But nevertheless, you’ll be delighted. Chocolate Peanut Butter Chip – My first question was whether or not this flavor would be more chocolate or more peanut butter. Is the touch of peanut butter only in the chips or is it dispersed throughout the pop? It took me a minute to put this one into words, but to answer my proposed questions, I’m fairly confident now in saying this one is more chocolate-based with the occasional surprise of peanut butter chip. And if I had to compare the taste to something else I’ve had before, it reminds me of drumsticks my Dad would always have in the freezer growing up. Do you remember those? Coconut Caramel Chocolate Chip – I mean just saying this flavor out loud makes my mouth water – aka makes me want to get in the car right now and pick some of these up at the nearest Target. Anyone else? I tried this flavor for the first-time last week and I’ve got to say that it is quite the gustatory experience! Coffee Chocolate Chip – If you love coffee-flavored frozen treats, then this is just the Yasso bar for you! It’s like a Starbucks Frappuccino after a long hard day except you can have three of them for the calories of one! Pistachio brittle – Move out tha way Mint Chocolate Chip, this green frozen yogurt bar is coming for ya! This bar tastes like the most luxurious almond milk, except richer & not almond…bc of like pistachios. YUMMMM. PLUS! you get a caramel-y piece of brittle with every nibble & it’s the perfect after work treat!! Rolling in the Dough – If you need an introduction to Yasso, go no further. This pint of frozen Greek yogurt will NOT disappoint. Honestly, I wish they’d make real cookies out of the cookie dough they use in this one. Incredible. And it’s jam-packed with flavorful bites, so you’ll never find yourself searching aimlessly with your spoon for the next right bite. Do yourself a favor, throw on the Notebook, pull out a pint, and share this treat with a friend! Party Animal – With rainbow sprinkles and chunks of real cake sprinkled throughout (but absolutely zero artificial colors or flavors), this is a party in a bowl, the perfect way to cap off any day in a decadent but nourishing way. For all my confetti cake fans out there, this is the pint(s) for you. It’s like confetti cake and confetti icing swirled together and were frozen together. Delicious! Caramel Pretzel-Mania – Well this one is literally such a party, y’all. I’m obsessed. From the very first bite, your taste buds are delightfully overwhelmed with the perfect balance of salty and sweet. It tastes like frozen Chocolate covered pretzels drizzled with smooth caramel. Coffee Brownie Break – Coffee brownie break is like sitting at your favorite coffee shop, your favorite book in hand. It’s one of those cheat days, so rather than a normal drip coffee with no cream or sugar, you ordered the latte, extra shot of espresso, with extra whip and a brownie on the side. Compliments to BTD Team Member, Nina Heselton for helping us put this excellent flavor into words. Chocolate PB & Yay – The taste is even more fun than the name. If you have children that loves a PB&J – prepare to ROCK THEIR WORLD. And know what’s even better? This frozen yogurt blend is healthier than any PB&J sandwich I’ve ever made with a fraction of the effort. Compliments to BTD Team Member, Katie Sequeira (@kmseq2) for helping us put this excellent flavor into words. Best of Both Swirlds – In the wise words of Hanna Montanna, all I need to say here is that you get the best of both worlds! But really, you can’t go wrong with classic vanilla and chocolate and together, they make for such a satisfying frozen treat – equal parts familiar and interesting with each bite. Loco Coco Caramel – One bite of Yasso’s Loco Coco Caramel and you’re instantly on the beach, fruity drink in hand, soaking up the summer sun! I’m not kidding, this drink will take you places with its rich, flavorful coconut and caramel blend.